We have owned Coco, a long haired chihuahua, for eleven years. The title is a quote from my friend who owned a dog of the same breed. This sums up my experience of owning a long haired chihuahua. Many years ago I didn't have much time for small dogs. I had never owned one, preferring medium to large dogs. Then I met my friend's new pet, a tiny chihuahua called Phoebe and my opinion changed. 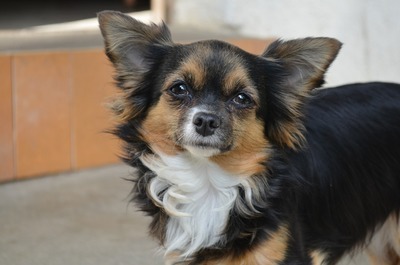 A year or two later Coco, a ten month old long haired chihuahua in need of a new home entered my life, my home and my heart. At first Coco was a shy, nervous dog who would tremble a lot. Soon his confidence increased as he settled into life at our place. He quickly worked out the rules. Rule number one, Max (the cat) was here first and has claws so must be respected at all times. They get on well but Coco usually lets Max go through the door first. Coco has a laid back personality which fits with the humans he lives with. If we were always running around, shouting and making lots of noise he might not be so laid back. He enjoys frequent naps, especially now he is twelve years old. His bed fits easily into a corner in the lounge room because of his small size. On the other hand, he is always happy to go for a walk and motivates me to get exercise. He just loves to get out in the big wide world and walk and sniff everything. He is a good conversation starter and I have made new friends through him. Before getting Coco I didn't know anything about his breed. I have done some research and found the following to be considered characteristics of a long haired chihuahua. Further reading suggests some chihuahuas may be difficult to house train. Coco was properly house trained when we got him so this has never been a problem. I have found him easy to train. He is aware that each person is an individual and he has certain ways of acting around each one of us. He will come to me if he wants to go for a walk because he knows I am most likely to take him. Although Coco will bark when visitors come to the door he is not overly yappy. He enjoys running around the back yard and will certainly bark if a stray cat enters his territory, but doesn't bark without reasonable cause. Because chihuahuas are so small it is easy for them to be hurt by young children. I notice Coco is wary if approached by a young child when we are out for a walk. Young children can get excited and squeal which he finds unsettling. Coco's best friend was my friend's chihuahua, Phoebe. They would run and play on the beach together and being of similar size and temperament did not hurt or frighten each other. When Coco was young a big dog picked him up by the scruff of the neck so both he and I are wary about big dogs. However, if the other dog is placid, Coco will relax and not bark at it. When he is unsure he will growl and bark. Coco is not as playful as when he was younger but sometimes enjoys playing with a ball, a soft one he can pick up with his teeth. He will bounce around on his hind legs if he is very excited. I have found Coco to be an excellent pet and companion, however a long haired chihuahua will not be the best pet for everyone. Bringing a dog into your household is a responsibility to be taken seriously so it is advisable to do some research on any breed of dog before committing yourself to ownership.